This strongly international issue begins with a guest editorial on the complex ethics of stained glass conservation focusing on the state of practice in Spain, along with two articles on American stained glass firms: the Victorian partnership of John and George H. Gibson in Philadelphia, and Charles J. Connick’s modern and Art Deco commissions produced from his Boston studio. Important work by British artist Henry Holiday for Philadelphia patrons is examined along with Arts & Crafts stained glass by Christopher Whall in Middleton Church, Lancashire. Technical Inquiry publishes the issues involved in conserving rare Catalan cloisonné stained glass and the concluding article on the conservation of glass in the Royal Apartments of Stirling Castle in Scotland. 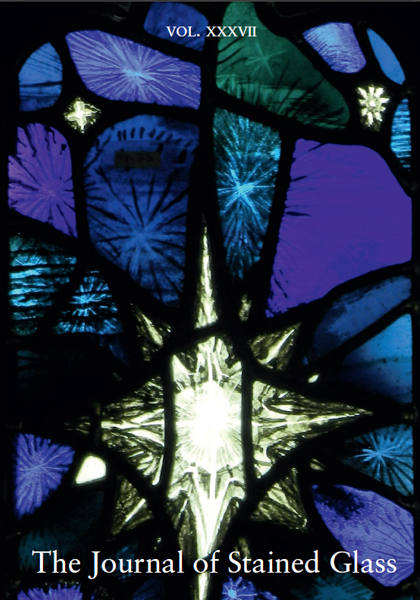 Plus a comprehensive study of the variety of marks used by the famous Kempe studio, and an outline of the work and collections of the London Stained Glass Repository. A Portfolio of New Work, and recent prizes and awards and seventeen book reviews round off the issue.